I saw this on Facebook the other day and it is so very true. 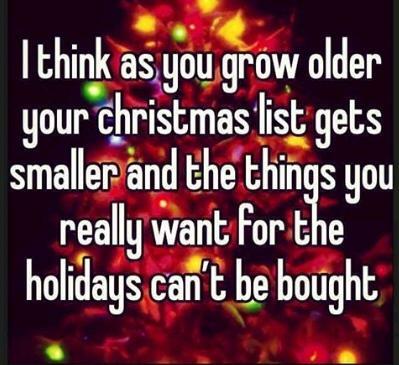 I count myself lucky when people ask what I want for Christmas or birthdays and I cannot think of a single thing. It shows that I am content with what I have and allows me to focus on what really matters. Things don’t matter. People and relationships do. Dreams matter; growth matters. I pray that you have a holiday filled with love and peace and all the everything that matter. Thanks, hon!! I hope you and your family have a wonderful holiday! A very Merry Christmas to you and yours, Cheryl! Thanks, Candace!! Merry Christmas to you and your family! !